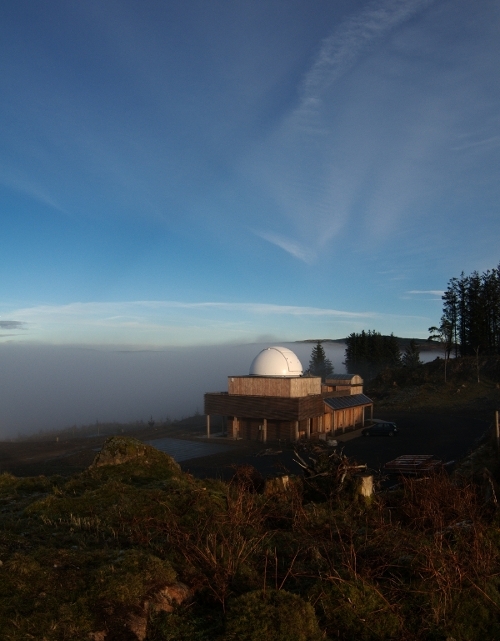 The Scottish Dark Sky Observatory occupies a fantastic hilltop site on the edge of the Galloway Forest Park. It is situated within the magical surroundings of Craigengillan Estate, rated by Historic Scotland as one of the top four Designed Landscapes in the country. This publicly accessible astronomical observatory lies within the Galloway Forest Dark Sky Park, near Dalmellington, under some of the darkest skies in the UK. The Galloway Forest Dark Sky Park is one of only two ‘gold tier’ Dark Sky Parks in the UK and is the only IDA (International Dark-Sky Association) gold tier park in Scotland to have a public use observatory. The Observatory is also situated in the Galloway and Southern Ayrshire UNESCO Biosphere which has been recognised internationally as a world class environment for people and nature. The UNESCO designation recognises the fantastic array of landscapes, wildlife, cultural, heritage and learning opportunities that south-west Scotland offers for communities, businesses and visitors to experience and celebrate in a sustainable way. The SDSO is proud to be a supporter of the Biosphere. A fully robotic 20” Corrected Dall Kirkham telescope in a 5 metre dome, which can be operated from a warm control room. A roll-off-roof observatory with a 14” Schmidt Cassegrain Telescope for a more hands-on, out in the open observing experience. A multi-purpose lecture/activity room and an ‘outdoor classroom’ in the form of an elevated observing deck from which visitors can enjoy the inspirational experience of naked-eye observation. Facilities are also available for amateur astronomers to be able to set up their own equipment and have access to the WC and kitchen amenities for a small fee. Visitors with impaired mobility or who use wheelchairs are requested to please make contact with the SDSO in advance of a booking or visit to allow us the opportunity to explain the limitations of the facility. As a charitable organisation we are always grateful to receive financial contributions to help operate and maintain the observatory and to fund the purchase of additional equipment. If you are interested in making a contribution we will be delighted to hear from you, so please get in touch.